Before the new Millennium developments occurred, the plot of green space in the central sunken section of the Bull Ring Shopping Centre, formerly the site of the bombed market hall, was Manzoni Gardens. It was here, for a brief period in 1972, that a remarkable public sculpture arrived in by crane and remained for six months. This was no ordinary civic gesture; this was Avant Garde!, part of the Peter Stuyvesant Foundation City Sculpture Project and according to newspapers of the day a project that would divide public opinion throughout Birmingham. What was it that caused Brum to stir? The answer, a 20ft fiberglass sculpture of an ape based on the screen legend King Kong, made in the Berkshire studio of sculptor Nicholas Munro it was one of several pieces of modern sculpture that came to the city as part of the sculpture project. What remains of this remarkable and controversial beast? Its recorded that after its six month tenure it was to be offered to the city for purchase, this didn’t happen and it was subsequently bought by a car dealer it became a familiar sight in the fore court of King Kong Kars. From there was then sold to a market salesman in Edinburgh where it stood, colossus like, over Ingliston Market and finally came to rest in the widow of the owner’s Cumbrian estate. Numerous photographs, web site pages and even a dedicated Facebook page keep ‘Brummie Kong’s’ memory alive, there have been local campaigns to have him brought back to the city. Peaky Blinders creator, Steven Knight has suggested that should King Kong ever return to the city, he be given a prominent place on top of the Rotunda, like a modern beacon. Let’s stay with this idea as it would be a most befitting place, his original namesake ascended that other architectural icon, the Empire State Building. It would seem that Ape and Architecture are intrinsically woven together in the consciousness of popular imagination. My personal interest in the sculpture stemmed from a fascination with that most modernist of failures, the 60’s Bull Ring Centre, yet throughout all the arguments and criticism as to why it failed there was always a positive reference to a particular moment in the early seventies when sculpture found a place there. Photographs of the period show groups of school children, bewildered pensioners and curious shoppers all standing around this alien beast. One particular image manages to capture striking workers sat aloft the ape’s shoulders, have they recruited this purple beast to their cause? I say purple as images suggest he was of a grey/blue/purple colour, whereas his smaller maquette, now in Wolverhampton Art Gallery, is a flash glossy black and far more in keeping with a streamlined Art Deco aesthetic. 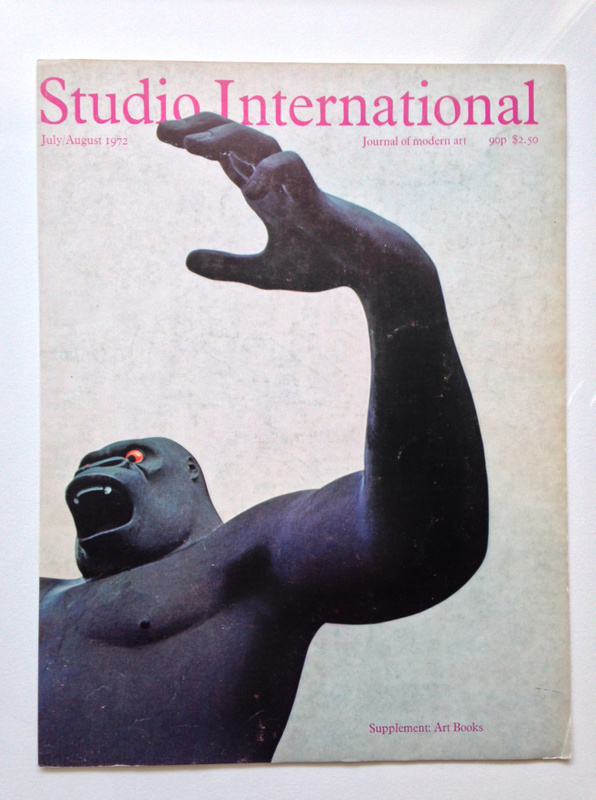 Its interesting reading periodicals of the time, Studio International, the foremost magazine on avant garde art, had Kong spread across its front and back cover, the actual City Sculpture supplement again featured the impressive beast seen from a low angle, he clearly was the most striking sculpture amongst the 15 entries. Cambridge had a Barry Flanaghan, Sheffield a Kenneth Martin, perhaps better established sculptors but none quite captured the post Pop Art zeitgeist as well as Munro’s contribution. The Birmingham Press had a field day, King Kong was that most photogenic of creatures, every angle suggested drama, Brummies by and large took to him and it was a moment of civic sadness when the council decided that they weren’t going to stump up the money in order to purchase him for the city. In some ways his subsequent years saw the beloved ape become a 3D advertisement for a car sales room/ garage in Camp Hill, its here that many recall seeing him rather than in his original setting, as he remained resident there for much longer. At some point he was briefly airlifted (by crane) into Aston University’s campus. He suffered most at the hands of the Scottish market holders where he was painted shocking pink and recent pictures found on the internet show him lying prostrate, neglected and icy white like a rare albino gorilla. Will he ever return? Well the ‘Bring Back Brummie Kong’ Facebook page seems to have many loyal supporters for the cause, if we go by comments and posts. The press frequently runs features about him, keeping the ape well in the collective mindset. Recently Steven Knight talked passionately about a campaign to bring back KK and amongst a generation that remembered him this would be the ideal solution, a sort of closure on this 42-year-old talking point. The problem is that a new generation have adopted the large brass bull, fondly called ‘Brasso’, who guards the 2004 Bullring shopping mall, he’s now become the new poster boy for Birmingham and time has naturally moved on from the days of Pop Art. The shock value of Munro’s Kong has been diluted; images of the sculpture in the Edinburgh market depict a shrunken presence with indifferent passers by. In some ways it was the badge of Fine Art that gave Birmingham’s Kong his controversial status, out of context he could merely be a sideshow prop. The images I have are from a personal archive, which started in 1998 shortly after I came to Birmingham to work at the University of Central England, now BCU. I became fascinated with the modernist failure that was the Bull Ring Centre, the retail behemoth was in its dying stages, decay and concrete corrosion were evident all around it. The only public art were peeling murals and it was hard to imagine a time when the place drew vast crowds to its malls. Amongst all the negativity was a mythical beast that once stood proud in the sunken garden, now home to alcoholics and those unfortunate to have lost their way from New Street Station. The manager of the Bull Ring Centre gave me some material, including newspaper clippings and photos, the sculptor himself corresponded with me and odd items surfaced on eBay from time to time. The collection grew from there. It would be good to hear from those who saw the sculpture at the time, many visited and plenty took photographs, these do feature occasionally on Facebook or Twitter immediately becoming highly viewed posts. For me and for many more, we can only imagine the story and in a similar way to the Hollywood legend it’s become more fantasy than reality. Though unlike the 1933 film there really was an ape that conquered an urban metropolis. Andrew Kulman is an artist, writer and educator who lives in Derbyshire and works in Birmingham. He currently runs Illustration at Birmingham City University where he is Professor of Graphic Art. His many interests include post war Birmingham architecture. Since 1998 he has collected material on modern Birmingham and has modest but well-formed archive.